I’d love to tell you about some more, yes more of the advantages of fermented vegetables, what one can ferment and how far and wide this food skill can expand and easily become part of your lifestyle. I am personally always experimenting and I love showing the Edible Alchemy community what is possible with fermented vegetables and the brine (i.e. probiotic salty water – think pickle juice!). Brine is one of the best by prodcuts of any food I know. It’s a tangy, salty and often even umami living liquid from my fermented veggies. This liquid is able to be used in so many diverse situations. Is this new lingo to you? Check out our sauerkraut lingo post in our Vegetable Fermentation Course A-Whey to buff up on your fermentation slang! Have you noticed how fermented vegetables are everywhere you go in the world? Sauerkraut in Germany, kimchi in Korean, pickled mango and okra in India…. Vegetable fermentation is found all around the world. It is time to reclaim this food preservation technique – look back at what our ancestors were up to and dig into new fusion flavors with the most probiotic benefit! Science is backing us up! You don’t need a giant plate of kraut or a full bowl of kimchi to have wonderful effects on your microbiome. A little goes a long way! Fermented vegetables are considered #bioavailable, which means the nutrients and minerals in the foods have been unlocked and are ready to be absorbed by our large intestine, thus to strengthen our immune systems and populate our gut with beneficial flora for better digestion, better skin, better mood…. We cannot underestimate the power of the microbiome. Although often a taboo to talk about the gut and digestion, we all privately know how important it is to our quality of daily life. We also know how enjoyable food can be and we shouldn’t be limiting ourselves to specific diets for ‘quick fix solutions’. 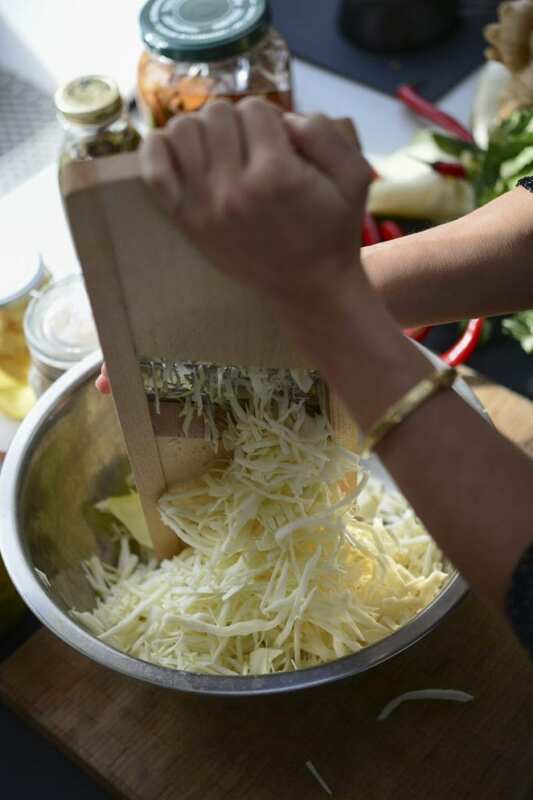 Rather get to the root of any health issues, which are often connected to the gut and a limited diet low in probiotics and mineral diversity, and find a rhythm in our lives and food skills to add to our repertoire! That’s why Edible Alchemy and the community is here to share all the tips & tricks to get started and go further into the depths of #realfood. 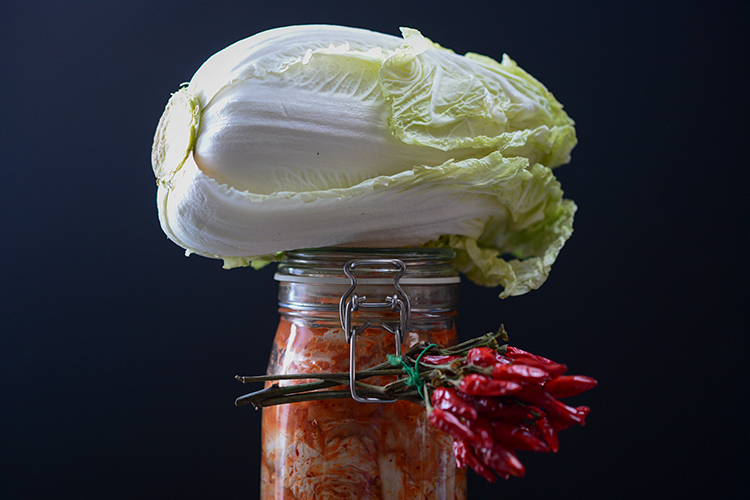 We have opened up our Vegetable Fermentation online course world wide where you can learn to ferment literally every vegetable around the house or in garden. Including Brussel sprouts. 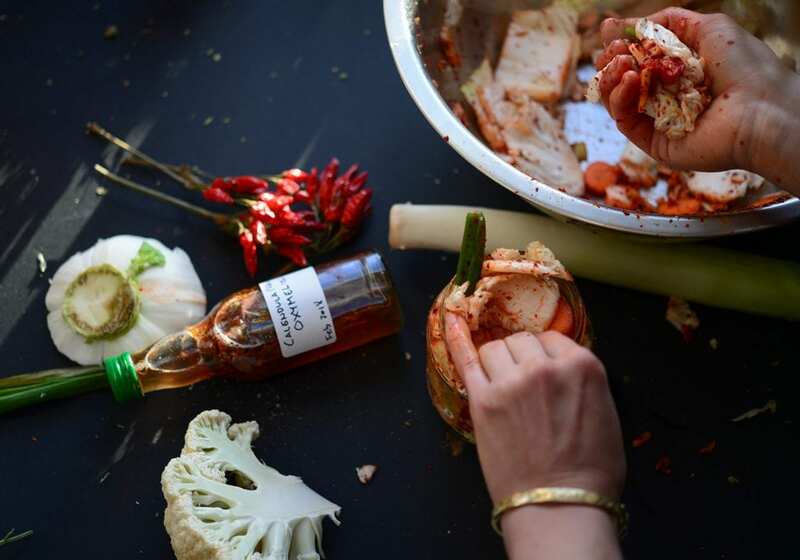 Including your hot chili peppers and even including your cabbage cores, broccoli stems and carrot leaves – things you would other considering throwing away – and put life in them! Less waste More taste! Check out the course Curriculum here! Right now in the course we have fermenters from all over the world who are expanding their skills and knowledge on the microbial world and strengthening their microbiomes one technique at a time. 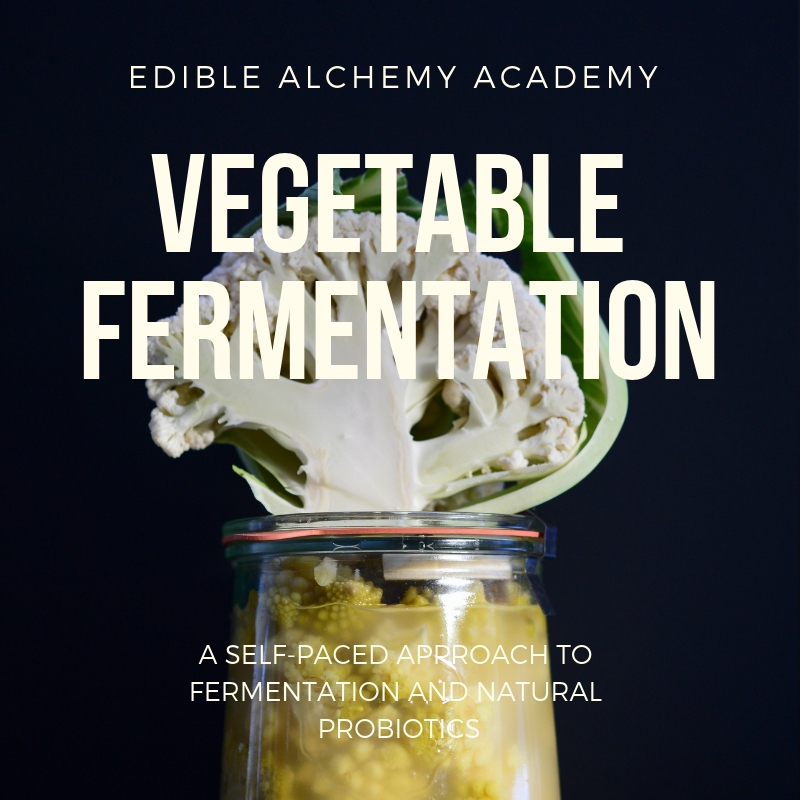 Use this course as your springboard into the world of lactic acid vegetable fermentation. Brined veggies example video. unlock more in the full course. Dive in and get bubbling and making your own lacto-fermented veggies!